We trust readers will enjoy and link to our new site, PropOrNot.org: Your Friendly Guide to Better Propaganda. 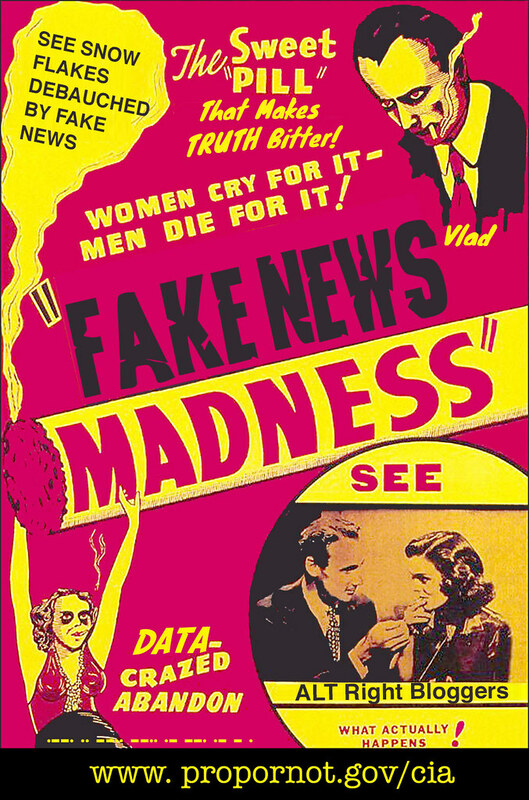 Its aim is to combat serious deterioration of the standards of American propaganda, with the ultimate goal of restoring the US to its standing of a propaganda export powerhouse. We include a case study on a site called PropOrNot that is so inept that it not only failed in its mission to institutionalize a blacklist of Evil Rooskie fake news sites, but got itself outed as a propagandist as well as “laughable,” “half-assed,” “amateurish,” “childish,” and “a mess.” The firestorm of criticism came not only from journalists but also experts on so-called “information operations.” This fiasco hampers its ability to run future missions. Our launch of the spoof site PropOrNot.org came out of a desire to create more balance among the responses to this McCarthyite initiative. Formulating a proper response to this threat to an open Internet has proven surprisingly complicated, given the need to balance competing considerations. On the one hand, the bizarrely amateurish aspects of PropOrNot make humorous and other light-hearted responses, like Paul Craig Robert’s request to Putin for a passport, and other websites complaining that they weren’t included in The List, quite reasonable. However, even these rejoinders are a bit of a double-edged sword: like a roast or comedy improv, they carry the joke further….which then risks reinforcing some of the underlying messaging. On the other, the enormous amount of credulous traction that the story has received in high-profile sources underscores the genuine seriousness of the affair. It is therefore entirely appropriate for affected parties to respond forcefully. Yet at the same time, it would be preferable not to feed into PropOrNot’s ludicrous self-image as a small band of persecuted Davids fighting a terrifying Goliath. Careful readers may recall that PropOrNot and its useful idiot Craig Timberg of the Washington Post flogged PropOrNot’s alleged expertise: “a nonpartisan collection of researchers with foreign policy, military and technology backgrounds.” However, if anyone in this group had any real tech or military chops, they would not have allowed yours truly to acquire the major related PropOrNot URLs (including propornot.org, propornot.net, propornot.biz, propornot.info, propornot.site, and quite a few others) even before the Washington Post story ran. So here’s what we are trying to do. In the State Department, we have pushed very hard on new media. So we have an Arabic Twitter feed. We have a Farsi Twitter feed. I have this group of young techno-experts who are out there engaging on websites and we’re putting all of our young Arabic-speaking diplomats out, so that they are talking about our values. Surely the use and analysis of the leaked emails which the DNC wants to censor are the “behavioral” traits indicating “Russian propaganda”, and the sites in every niche being most successful are the “analytics” which figured into their listing. If you want to double down, start with the Hillary campaign’s press surrogates (p5), as featured in the several “presstitutes” stories that went around a month or three ago. I’m gonna submit propornor.org to their reddit and watch their brain’s explode. Yes, I knew the PropOrNot site was up before the WaPo story ran and chose to ignore it since as of then it was getting no traffic. Why feed trolls? If anyone wants to do some sleuthing, look at positive retweets of propornot tweets. Maybe some retweets are signal boosts made by propornot members. Especially suspicious are new twitter accounts, say started in November, that bellyache about the New Yorker story and favorably retweet Amb. McFaul. At first I thought propornot was an elaborate alt-right or even Russian troll on the Post and similar outlets, but the organization is too profoundly tone deaf to be a spoof.